These cinnamon rolls are soft, fragrant, and beautiful -- plus naturally fermented for additional nutrients and easier digestion! Makes 16 cinnamon rolls. Add 2/3 cup all-purpose einkorn flour. Add 3 1/2 cups all-purpose einkorn flour. I use a medium sieve to sift it straight into the bowl. Transfer dough to refrigerator for 8 to 12 hours. This cold fermentation keeps the dough from getting sour. Einkorn's simpler structure and high mineral content causes it to ferment more quickly than most other grains. Roll it out to make a rectangular shape. The size isn't that important -- you can stretch it later -- but I aim for about the size of 2 large cutting boards. The dough will want to spring back at first, but keep rolling and it will stretch nicely. *Feel free to use whole grain einkorn flour instead of all-purpose. Keep in mind that the dough will be slightly harder to work with. Also, don't ferment it as long since whole grain flour sours much more quickly. *I call this recipe sourdough but perhaps it is better called naturally leavened. I don't let it get too sour. Milk and butter both prevent sourness, as well as the addition of salt early on. Refrigeration also controls the level of sourness. *If you prefer, cut more strips to make smaller rolls. 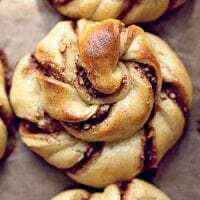 *Substitute ground cardamom for cinnamon and almonds for pecans in the filling -- and enjoy a lovely variation of Swedish cardamom rolls!